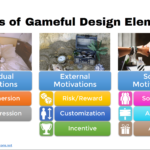 In part 1, I presented an overview of our research study that classified the most commonly used gameful design elements according to user preferences, and in part 2 I listed which elements make part of each group of user preferences. 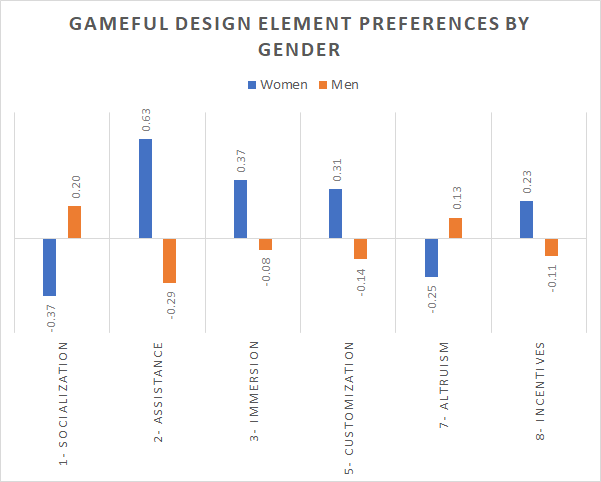 In the last post of this series, let’s look at how the participants’ gender, age, personality, and user types influenced their preferences for the gameful design elements in our study. The results showed that women generally prefer Assistance, Immersion, Customization, and Incentive elements more than men. On the other hand, men tend to prefer Socialization and Altruism elements more then women. There were no significant gender differences for Risk/Reward and Progression elements. The results showed that there is a small difference in preference by age for some of the groups, although it is not completely linear. 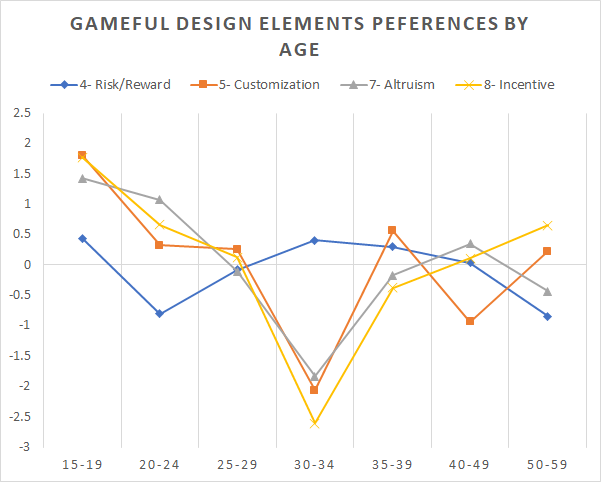 As you can see in the chart below, preferences for Customization, Altruism, and Incentive elements were higher for participants aged 15–24, lowered significantly for participants aged 30–34, and then increased again for participants aged 35 or more, although not as high as the younger participants. Preferences for Risk and Reward, on the other hand, were higher for participants aged 15–19 and 30–34, and lower for participants aged 20–24 and 50+. 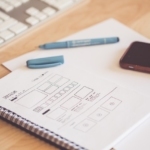 The differences were not significant for all the other groups of gameful design elements. Considering participants personality traits (based on the Five-Factor personality model), there were only a few significant correlations. 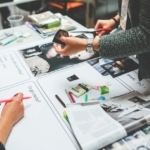 Results showed that participants that scored higher in Extraversion tended to also prefer Socialization and Assistance elements. Similarly, participants that scored higher in Openness to new experiences also tended to prefer Customization elements. Finally, there was also a weak correlation between participants’ Neuroticism scores and their preference for Incentive elements. 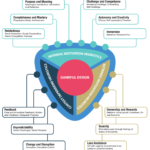 The Hexad gamification user types were created especially to represent different style of interactions with gameful systems. Therefore, we would expect that there would be several significant relationships between the different user type scores and participants’ preferences, which really happened, as summarized in the following table. Socialization elements are preferred by men, socialisers, and extroverts. Assistance elements are preferred by women and extroverts. Immersion elements are preferred by women, achievers, and free spirits. Risk/Reward elements are preferred by younger achievers and players. Customization elements are preferred by younger women who are more open to experiences. Progression preferences are not clearly explained by any of studied variables, although achievers and philanthropists tend to enjoy them more than others. Altruism elements are preferred by younger men, philanthropists, and socialisers. Incentive elements are preferred by younger players, who score higher on neuroticism.